Laid out in 1812 to honor the soldiers who lost their lives in the War of 1812, Chippewa Square is one of Savannah’s most well-known squares, and not just because it was featured in the blockbuster movie Forrest Gump! The 15th square to be established in the city, Chippewa is located between Hull and Perry Streets, which puts it close to many of Savannah’s most popular sights and attractions; in fact, it’s known by many as “the gateway” square. This lovely square boasts towering oaks and tranquil spots with benches to sit and admire the view. To help you plan your Savannah vacation, here’s a guide to all you can see and do in and around Chippewa Square. The centerpiece of Chippewa Square, this nine-foot sculpture pays tribute to the city of Savannah’s founder James Oglethorpe. The bronze statue is the embodiment of Oglethorpe, featuring him in his military garb with his sword drawn. Founded in 1775, this beautiful house of worship was the first Presbyterian church in Georgia. The first building was destroyed by fire, but the building that stands today, built in the late 1800s, has many of the original sanctuary’s features, including the marble baptism font which is still used. With its gorgeous architecture and rich history, the church is worthy of a visit while in the area of Chippewa Square. Less than two miles from Chippewa Square, the Cathedral of St. John the Baptist is a striking landmark in Savannah, gracing the skyline with its towering steeples. Dedicated in 1876, the church features numerous stained glass windows, lofty ceilings and breathtaking architectural elements reminiscent of an ancient European cathedral. Among the city’s most visited sites, the cathedral offers tours and is open to the public. Opening its doors in 1818, the Historic Savannah Theater has a fascinating, colorful past. Since its first production, the theater has hosted famed performers including Oscar Wilde, Sarah Bernhardt, W.C. Fields, Otis Skinner, and Edwin Booth (brother of infamous John Wilkes Booth). Today, it’s home to an array of entertainment, from concerts to touring Broadway shows. The art deco style building is a sight to see, as is the museum in the lobby that tracks the theater’s history. Just footsteps away from Chippewa Square, Drayton Glassworks offers a unique and interesting experience to visitors of all ages. If you can, sign up for a glassblowing class where the owner of the shop teaches you his trade and allows you to make your own creation to take home. Also, it’s a great place to pick up one-of-a-kind keepsakes and gifts for the folks back home. This unique museum is named in honor of Ralph Mark Gilbert who led the modern Civil Rights movement in Savannah and served as the President of the NAACP (National Association for the Advancement of Colored People) during the mid 1940s. The museum shares the Civil Rights struggle of the oldest African-American community from slavery to present day. Browse through three floors of interactive exhibits and historic photographs that offer a look at what life was like for the African-Americans in Savannah and Georgia. Named after the 33rd Governor of Georgia, John Forsyth, the sprawling urban park is 30 acres of beautiful green space. The Forsyth Fountain is breathtaking and a focal point of the park, where people gather throughout the year and enjoy lounging on the surrounding benches. At the park, you’ll find it’s a place where locals and visitors like to picnic, jog, bike and simply enjoy the scenery. While you’re here, make sure you take a moment to view the various monuments including the Confederate Monument which is dedicated to the soldiers who fought for the confederacy during the Civil War. 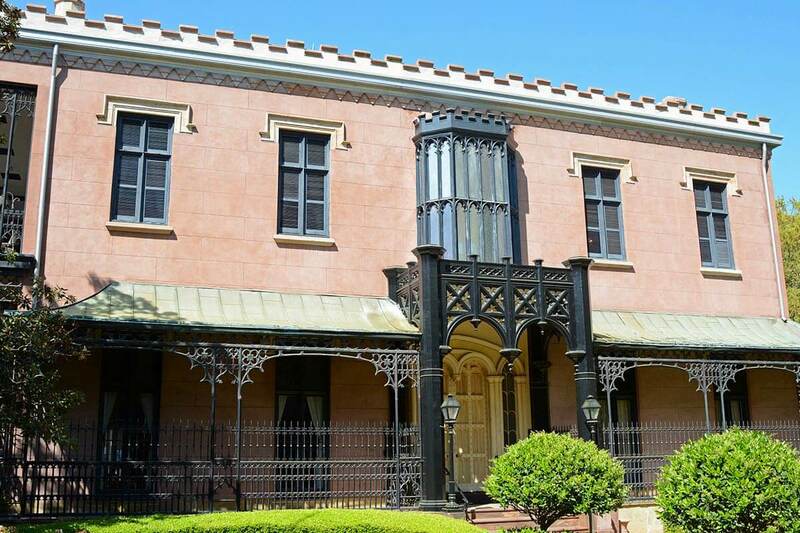 A National Historic Landmark, the Green-Meldrim House is known as one of the most beautiful examples of Gothic-Revival architecture in the south. Built between 1853 and 1861, it served as the headquarters for General Sherman when the Union Army captured Savannah in 1864. 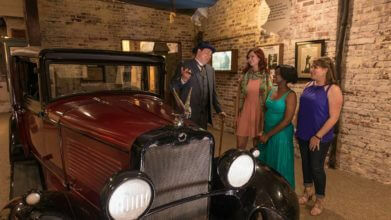 Take a tour to view original furnishings, artifacts and historical documents as well. A great outing for people of all ages, the Georgia State Railroad Museum is home to one of the largest collections of historic railroad cars. Here, you can view rolling stock on display, learn all about the history of the railroad in Georgia, enjoy a train ride, take a tour of rail cars and much more. Located within the former Central of Georgia Railway and Roundhouse and Repair Shops, the museum is less than two miles from Chippewa Square. Open from 11am to 3pm, this quaint Savannah café has earned a reputation for its unique paninis including the grilled asparagus or the tomato guacamole. They also have delectable soups, fresh salads and small plates. Housed inside a restored Victorian, the atmosphere is warm and welcoming – a great spot to enjoy lunch while taking in the view. Light, bright and casual, the Atlantic transformed an old gas station into a warm and inviting eatery. Enjoy a cocktail on the patio and dine in comfort in their relaxed dining room. Their menu has something for everyone, including cool bites like mushroom pate and crab toast, hot bites including sardines and shishito peppers and small and big plates of southern favorites like duck breast, salmon, sautéed shrimp and much more. If you’re looking for a mouthwatering burger with house-made fries and house-made ketchup, the Green Truck Pub is where you want to go. This family-owned restaurant has an array of gourmet burgers (try the Greek style or the Trailer Park! ), salads, soups and sandwiches (the Chicken and Apples is a local favorite). And the best part—they source everything, including their produce, meats and coffee from local farms and businesses. laid-back, yet elegant eatery where favorites like shrimp and grits have a contemporary, upscale twist. Menu items include red beet tartar, mussels, stuffed Carolina trout and hanger steak, among others. For succulent ribs and other BBQ cuisine, head over to Tricks, just a short distance from Chippewa Square. Beans, potato salad and other sides are the perfect accompaniments to their house special ribs, chicken and lamb. And don’t forget to order dessert! One of Savannah’s most well-known restaurants, the historic Mrs. Wilkes Dining Room is a few minutes from Chippewa Square. Serving lunch from 11am to 2pm, it’s a good idea to get there early as the line begins to form before the restaurant opens. Here, you’ll be seated at a large table where you’ll dine alongside other patrons, enjoying family-sized platters filled with homemade southern-fried chicken, sweet potato soufflé, black-eye peas, fried okra, corn muffins and more. Featuring the original creations of SCAD (Savannah College of Art and Design) students, ShopSCAD offers an array of unique items including jewelry, clothing, greeting cards, paintings, accessories and much more. Stop in, browse and pick up something for a loved one back home or as a memento of your vacation. A Savannah gem just one mile from Chippewa Square, the Olfactory Company is a definite must-visit while in the area. You’ll be amazed by their diverse array of handmade bar soaps, luxury shaving supplies, perfumes, soy candles, teas and a large assortment of quirky gifts, including mood rings, wind-up space aliens and much more. Jewelry, tops, scarves, dresses, shoes and many items made by local artisans are what you’ll find at this charming Savannah boutique not far from Chippewa Square. Stop in and browse their selection; this locally owned and operated shop has it all! An open-air market located by the river, the River Street Market Place is chock full of unique items from around the world. From t-shirts, photographs and silver, to artifacts, antique bottles, prehistoric sharks’ teeth, handmade jewelry and more, there’s something for everyone. While you’re here, be sure to check out the Waving Girl statue—an iconic Savannah landmark. A blast from the past, this unique shop is the place to go to peruse vintage threads and accessories from the 1920s through the 1990s. The Future of Forsyth has clothing, jewelry, hats, handbags and vintage pieces from many top designers including Gucci, Louis Vuitton, Kate Spade, YSL and more. A little bit funky and stocked with a variety of rare items, this little shop in Savannah is worth a stop. Featuring an eclectic collection of folk, traditional and contemporary art, accent furniture, handmade greeting cards, pottery, textiles and jewelry, Folklorico doesn’t disappoint those searching for the perfect gift, conversation piece or keepsake. For music lovers and those with a curiosity for the unusual, this record shop hits the spot. Browse through their large collection of vintage vinyls, pop culture items, taxidermy and collectibles. Head to the back of the store to play some classic arcade games and find your favorite album—they have everything from hip hop, soul, heavy metal and punk to hard rock, indie and soundtracks. If you’re a fan of this celebrity chef and restaurateur, you’ll have a ball shopping in her store! The Paula Deen Store gives you the opportunity to bring home cookbooks, linens, cookware, spices, sauces, mixes and much more from her brand. 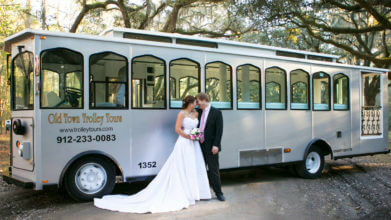 See it all on the Trolley! 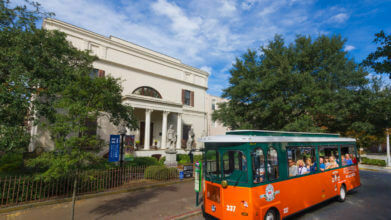 For everything you want to see and do, hop on the Old Town Trolley! The orange and green trolley will not only transport you to Chippewa Square, but to more than 100 other points of interest in the city. And, because you can hop off and spend as much time as you wish at any of the stops, you can see and do everything at your own pace.